In 2005, Liverpool were interested in signing Michael Owen, after he had spent a year at Real Madrid, but they didn’t want to pay more than the £8M they had received from Real Madrid the year before. Then Newcastle moved in and offered a staggering £17M ( money Newcastle didn’t have as it turned out) for the Real Madrid striker, and one of the reasons for that high bid was they knew Liverpool would be unwilling to pay that amount to get their striker back. 25,000 Geordie fans welcomed Michael to St. James’ Park that summer, but the next four years were to be a list of injuries that kept Michael from playing for the Magpies, and at the end of his contract, Newcastle had been relegated in 2009. Owen played only 79 times for Newcastle and scored 30 goals in his four years at Newcastle, and that was not a lot for a player getting £110K/week. 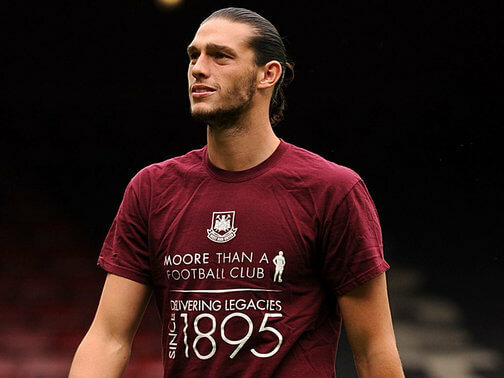 The situation with Andy Carroll seems similar to what it was in 2005 with Owen, with West Ham bidding a sky-high £15.5M for the striker, partly because they don’t want his former club Newcastle coming in for him. It seems that West Ham have been successful, because Newcastle will not pay that amount to get their striker back, although the Hammers still have to persuade a reluctant Gateshead lad to sign on at the east London club, as it seems he would love to come back home. If Andy does sign for West Ham, for their sake, we hope he does a lot better than Michael Owen did at Newcastle. Andy currently has an injured heel and will be out for four months. 283Markaccus // May 23, 2013 at 2:14 PMSpoof… and with that world class quote you are promoted head of PR! You will work closely with G on media and press reputation! Tsunki…. how does “Catering Executive” sound? I take it that I am alowed to use agressive marketing. Tsunki – Your position as head of pies gives you free season tickets. Just because i like pies. The rest of you need to pay, we need the money! Us beeing on the 20th richest club list is missleading. Have you not heard about agent fees? This makes me.an ideal owner of a football club. Abramovich and sheik rattle-n-roll or whatever cities owner is called, are both basically filthy rich armchair footy fans. Ed give this Carroll talk a rest will ya!? He is not what we need anyway. We need pace upfront! Does my dirty dekka role include dirty women? There are difference between the two – Owen was interested in one thing only – his England caps. I think AC has a bit more depth towards this football than that. Rainrix… Your role is clear then. Blatantlyfakewebsite.com is genius. Chicken Balti Pie – What? Replaced what by? C.E. – We’ve got an almost identical clone to the greggs Steak Bake lined up. C.B.P. – Its because I am Indian, isnt it? ISN’T IT? C.E. – …………………………………………………………. Forget everything I said, I didn’t mean it ha ha ha just a joke ha ha ha got you there – right back to work enough of this joshing around ha ha…. Hopefully West Ham sign up AC very quickly – do you think we would have to pay them much to take bambi as well? ?